Happy Tuesday Friends!! 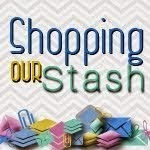 Are you ready for another challenge from the SHOPPING OUR STASH crew??? Valentine's Day is just around the corner, so this week's theme is LOVE ME DO. We'd like to see you make a love themed project this week. Sing along with me now...you know you want to!! Love love me do. You know I love you. I'll always be true. So pleeeeeeeeaaaaasssssse...love me do. 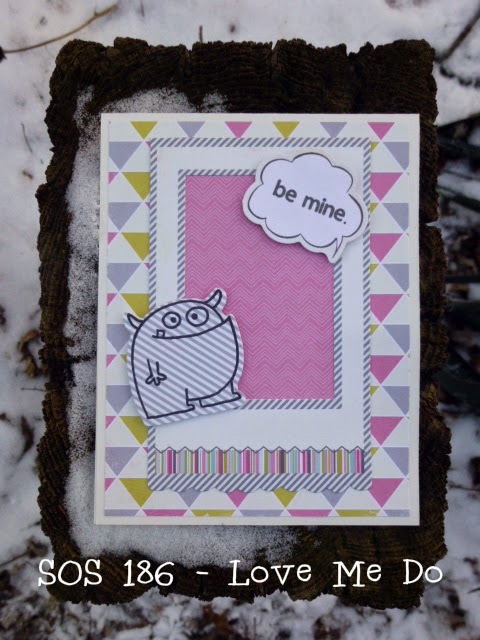 Check out the SHOPPING OUT STASH BLOG for all the details on this challenge and while you are there, show the crew some crafty lovin'...it is almost Valentine's Day after all!! 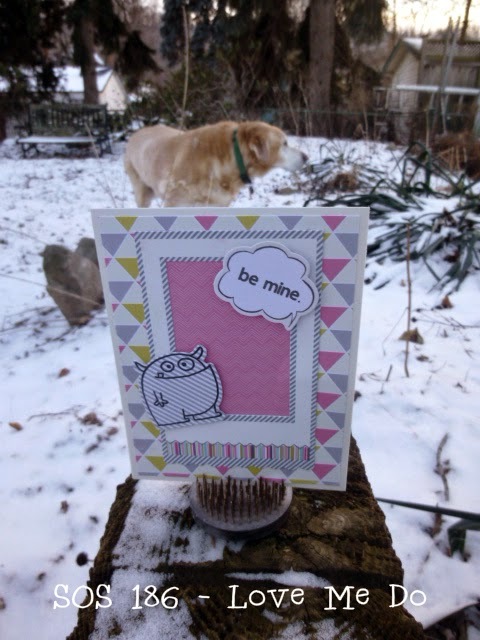 Here's another shot of the card with the yellow dog photobomber in the background. Good ole Gordo, there's nothing he loves more than following me around the garden when I am trying to take dog-free pictures...heaven forbid you point the camera at him though...he thinks you're stealing his soul!! You may notice a slight bend on one side of the card, on the way out to the yard Gordo took a slip backwards down the stairs...I am getting pretty good at catching a 125 lb dog on the stairs to prevent injury (his and mine). Poor old fella, he doesn't see so well or hear so well or climb stairs so well, but he does so love being outside when it's FREEZING out! Super cute monster card, Love the picture with Gordon in the background. I'm impressed with your fortitude to go outside and take a photo! I'd be like, nope.... too cold. Gordo go pee in the tub. Or the rub. I don't mind, just don't expect me to come out from under this electric blanket. Anywho... cute card. Love the little monster. I always forget that cute monsters make cute VD cards. Love the love monster! Totes Adorbs! Even more so is Gordon, the photobombing yellow dog!! What a cutie! Oh poor Gordon! Good thing you're practiced at catching him, lol! And what IS that about the camera stealing their soul? I swear, we're just trying to show everyone how awesome you are! I love the great patterns & that MONSTAH! Love the monstah, and those Fancy Pants papers, too! Terrific card and so happy to see your senior dog enjoying the winter... we have a 100lb lab who has a love/hate relationship with stairs too... he LOVES the chance to go down to the family playroom, hates the climb back up the stairs! Thx for stopping by my blog, too! This is just so "stinkin" cute! Love it!